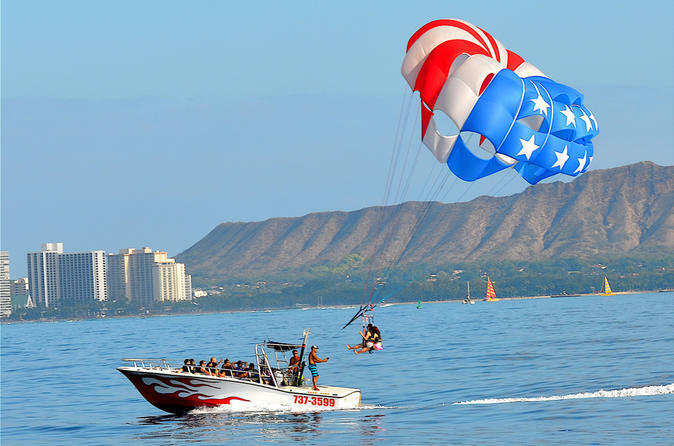 See the famous Waikiki skyline from 500 feet (152 meters) in the air, as you peacefully cruise in a parasail canopy above Oahu's south shore. Choose from multiple times throughout the day to enjoy the 1-hour cruise, where views stretch out past Diamond Head and the Ko'olau Mountains beyond. If it's your first time going parasailing, the moderate heights make this the perfect way to enjoy a bird's-eye view. You'll check in for your parasailing tour at Kewalo Basin Harbor, unless you're staying in a Waikiki hotel where pickup services are offered. With tour times that run throughout the day from 8am-5pm, you can pick the time that works best with your schedule to go soaring above the coast. Upon boarding the boat you'll first motor out past the surfers, boat traffic, and waves, and go over some safety information before getting strapped in to your harness. When it's time to head up into the air, feel the wind as it fills your canopy and you drift away from the boat, and hear the rush of enveloping silence you experience from up in your perch. At a moderate height of 500 feet this tour is great for beginners, or those who are new to parasailing but still want a rush of adrenaline. Once you're safely back on deck and have docked back at the harbor, ask about photo and GoPro footage you can purchase right there on the boat. After everyone on the boat has had the chance to go for a ride, the tour ends either back at the harbor or with a drop-off at your hotel.